A long-running legal battle has entered a new phase with conservation groups and the Nez Perce Tribe challenging a federal plan that describes river bottom dredging as the only currently useable tool for maintaining Snake River portions of a commercial navigation channel for shipping goods in and out of the inland Columbia River basin. In an "amended complaint" filed Tuesday in the U.S. District Court for Western Washington a coalition of conservation groups and the Nez Perce Tribe ask for a court declaration that the Corps violated National Environmental Policy Act by issuing a final environmental impact statement and records of decision late last year regarding channel maintenance. The complaint says the Corps decisions "fail to include a reasonable range of alternatives for the dredging action and the long-term PSMP; fail to take a hard look at the impacts of the Corps' dredging action on Pacific lamprey, salmon, and steelhead and that fail to take a hard look at the effects of climate change over the period of the PSMP; and fail to provide an accurate and unbiased analysis of all of the relevant costs and benefits of the dredging action and the long-term PSMP, and the alternatives to those actions." The PSMP, the U.S. Army Corps of Engineers' Programmatic Sediment Management Plan released late last year, outlines potential strategies, including dredging, for management of sediment that drifts downriver and ultimately fills in areas of the navigation channel, making it difficult and in some cases unsafe to navigate. For information about the Corps' Programmatic Sediment Management Plan, see the Walla Walla District website at www.nww.usace.army.mil/Missions/Projects/ProgrammaticSedimentManagementPlan.aspx. The legal brief filed this week also calls for injunctive relief -- asking that future dredging be prevented and that impacts, particularly to salmon and lamprey, caused by current dredging be addressed. Plaintiffs in the lawsuit include Idaho Rivers United, Washington Wildlife Federation, Sierra Club, Pacific Coast Federation of Fishermen's Associations, Institute for Fisheries Resources, and Friends of the Clearwater and the Nez Perce Tribe. The tribe and conservation groups have long demanded that the federal government develop a plan to prevent sediment infiltration of the federally maintained navigation channel, rather than relying on dredging. They say dredging disturbs in-river habitat for salmon, steelhead and lamprey migrants and rearing fish. The dredging provides the necessary depth for fully loaded barges to bring grain and other goods up and down the river. The federally maintained navigation channel overall stretches from the Idaho border out to the Pacific Ocean. The amended complaint says that the Corps' immediate need for dredging action -- the activity now ongoing to restore desired navigation channel depth and width -- "involves scraping nearly a half million cubic yards of sediments from the bottom of the Snake River, transporting those sediments downstream, and dumping the sediment back into the Snake River in a location downstream where sediment will not interfere with barge navigation." "Both the dredging and in-river dumping will mobilize sediments into the water column, increase turbidity locally and downstream, harass juvenile and adult fish and Pacific lamprey in and adjacent to the project area, damage or eliminate rearing habitat for Pacific lamprey and threatened Snake River fall chinook, and impact the base of the food chain on which all aquatic organisms rely. "The dredging and dumping activities will also likely harm, kill, or displace Pacific lamprey, as well as ESA-listed adult steelhead and overwintering juvenile fall chinook salmon," the amended complaint says. According to the court schedule, the federal government now has until March 3 to respond to the complaint. The U.S. District Court in a Jan. 7 order denied a preliminary injunction request to stop this season's dredging, saying that the benefits of dredging outweigh alleged harms that might come through river disturbances that might affect Pacific lamprey and protected salmon and steelhead. 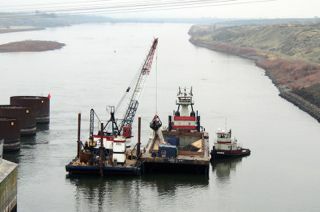 According to the Corps, its dredging contractor continues to make progress on maintenance dredging on the Snake River between river miles 138 and 139.5 and on the Clearwater River between river miles 0.6 and 2. The dredging locations are at the confluence of the Snake and Clearwater rivers, Ice Harbor, and the berthing areas of ports of Clarkston and Lewiston. Mariners are reminded to maintain safe distances from dredging equipment and not to change their operations until post-dredge surveys are completed, the Corps says. Once the Corps verifies there are no remaining high spots and elevations are validated by surveys, a formal notice to navigators will be sent. That near-term dredging plan is intended to restore to congressionally mandated depth and width standards, particularly, segments of a commercial navigation channel near the confluence of the Clearwater and Snake rivers at the Idaho-Washington border. 1. Declare, adjudge, and order that the EIS and accompanying RODs issued by the Corps are arbitrary, capricious, and not in accordance with law, and that the Corps is in violation of NEPA, the CWA, and the APA; 2. Vacate, set aside, and remand the EIS and accompanying RODs; 3. Enjoin the Corps to withdraw the EIS and accompanying RODs; 4. Enjoin the Corps from commencing dredging activities in the lower Snake River pending completion of a valid EIS and RODs and/or to ameliorate or mitigate the impacts of actions proposed in the EIS and RODs already undertaken by the Corps; 5. Enjoin the Corps from undertaking future immediate need actions under the PSMP pending completion of a valid EIS that complies with NEPA and the CWA, and 6. Enjoin the Corps from taking action that is harmful to fish in order to accommodate uninterrupted navigation pending completion of a valid EIS and ROD.